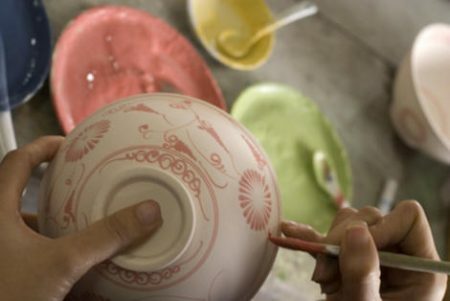 Before touching the ceramic, the hands must be washed, because color and skin fat affect the durability of the color when burning. Before firing, the colors are still a little pale, they are really strong in the oven. You will get the best results if you apply the primer paint three times in a row (also white color). It should be noted that the lighter colors are applied first and the darker ones last. The edge on which the ceramic is later, we call Stellrand. It should be unpainted so that the ceramic does not burn in the oven at the bottom. But do not worry, we will eliminate small spots of color before burning.